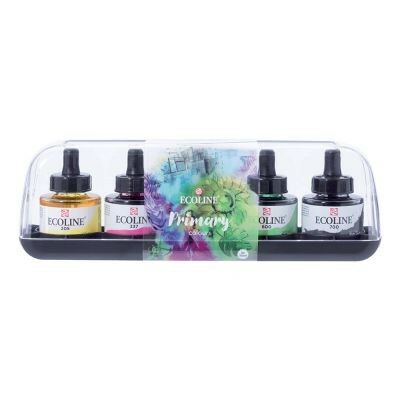 This set of 5 Primary colours of Ecoline Liquid Watercolour Inks offer artists a vibrant and rewettable fluid watercolour that is suitable for a range of artistic techniques. Ecoline inks are transparent and dye-based and can be used just like regular watercolours to create washes and detailed illustrations. Each colour comes in a glass jar that has a pipette fitted to the lid; this pipette is great for calculating your colour mixes and for dropping colour straight onto your palette. These inks are fluid enough to be used straight from the bottle, but they can be further thinned with watercolour if needed. The colours are rewettable once dry to allow for easy mixing. As these inks are dye based they are not lightfast, therefore it is recommended that your work is stored away from direct sunlight. They are usable on any surface suited for watercolour; use them for painting, product design, illustration, fashion design or even calligraphy! Suitable for application with a brush, dip pen, ruling pen or fountain pen. 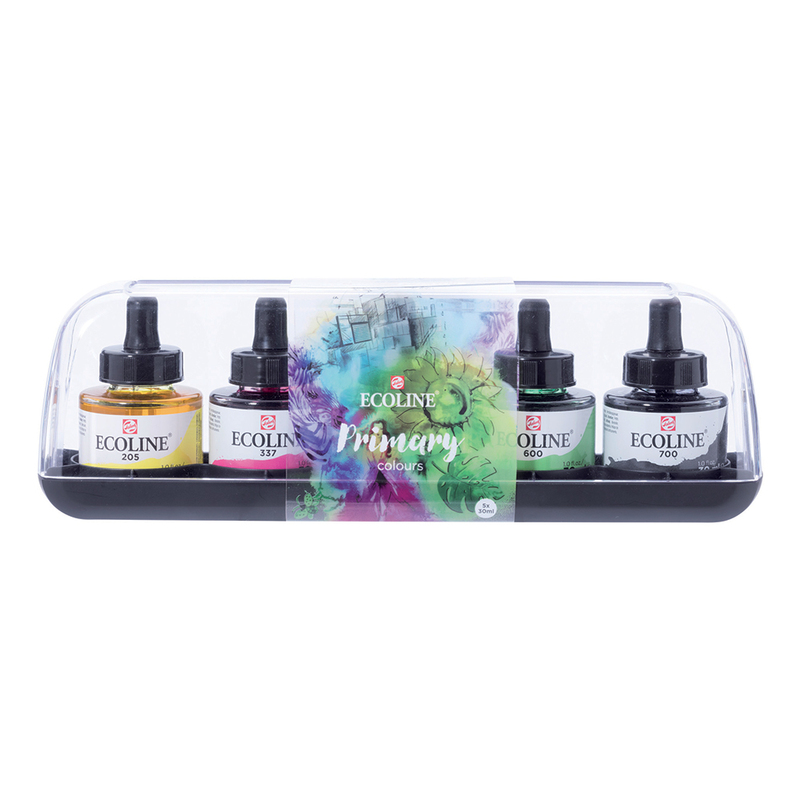 This set comtains 5 x 30ml bottles of Ecoline Ink in a selection of Primary Colours; Lemon Yellow, Magenta, Sky Blue (Cyan), Green and Black. The outer plastic case for the set of bottles was broken on arrival. The bottles arrived unbroken and the outer casing is being replaced on the next order.